Applications of Control Booths in Industrial Operations | BIG Enterprises Inc. Although many industries use control booths, they have become a common fixture for industrial businesses. Specific to industrial operations, these booths are used for a variety of applications with the overall goal of protecting workers, the property, equipment, and goods inside. Guard House – Often, control booths are used as a type of guard house. With an increasing need for security, these booths are outfitted with the necessary equipment for this very purpose. When placed outside away from the main building, the booth attendant can monitor and control comings and goings. If required, a camera, floodlights, and other safety features can be added. Information – This type of booth also serves as a point of information. For instance, people visiting a manufacturing company, plant, mine, mill, railyard, dredge, or warehouse can stop by the booth to get information and directions. This allows your attendant to guide traffic where it is supposed to go. By choosing a booth with 360-degree visibility, visitors can easily identify the booth. However, this also gives the attendant a better view of people and the property. Controls – In some situations, a control booth can be used for operating various controls. In addition to monitoring and controlling critical areas on the exterior of your company, when properly equipped, the booth attendant can open and close gates and more. Bulk Material Handling – For monitoring transfer operations and performing office duties associated with the drilling, extraction, and transportation of gas and oil, many companies rely on booths. Operator Shelter – Booths can be placed in truck loading, material-handling, warehouse loading, and rail car loading areas where they serve as shelters that provide employees protection, as well as shelter. 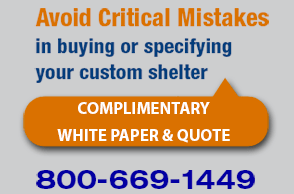 Environmental Shelter – If control booths are placed outside of hazardous locations, they can be equipped with break-resistant windows, sound-deadening walls and ceilings, and a blast-resistant construction. Shelter – For some industrial applications, control booths provide workers in remote locations with shelter. For instance, your workers have a place to get out of the heat or cold when on the job. Regardless of the industrial application, it is imperative that you turn to a trusted source when in the market for a booth. At B.I.G. Enterprises, we offer a wide range of design and amenity options. To learn more about our products or to purchase a booth, please call us today.